Brick is a ceramic. Antique brick, when cut thin into tiles for use on walls is essentially an unglazed ceramic tile, very similar to a terra cotta tile. Installation is the same- they are adhered to the wall using mastic or thin set, and then grouted. They can be grouted with a sanded tile grout, but many people will use a Mason’s mortar as a thin brick grout. Both products are a mix of Portland cement and aggregate, but the mason’s mortar will have a courser grind to the aggregate, which can give the installation a more authentic brick look. Some people will choose to use a sanded tile grout, especially if they are trying to get a specific color. Make sure the surface is clean and sound. Do not install directly on to a painted surface. In this case either you should put up a cement board or tile backerboard. Snap chalk lines every third course of bricks. For a standard 3/8” mortar joint, with our 2 ¼” tall bricks, this means chalk lines every 7 7/8”. If this is going to result in a horizontal cut on the last row of bricks, you may want to fudge the size of the grout lines slightly more or less to avoid having to install a row of cut bricks and refigure this measurement. Adhere the tiles using an acrylic modified thin set or a tile mastic. We like CUSTOM BUILDING MATERIALS “OMNI GRIP®” because the bricks will not sag or slip during the installation. This comes in a premixed tub. Apply the mastic or thin set to the wall using a ¼” X ¼” notch trowel. 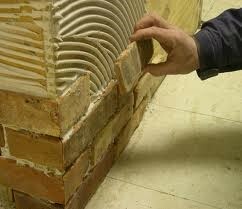 Apply just enough area at a time that you can install the bricks within the mortars working time. Use a diamond blade wet saw to make any cuts you need at the edges. Once the bricks are applied, wait 24-48 hours before grouting. It helps to PRE-SEAL the brick before grouting to make it easier to get the tiles clean. We like “MIRACLESEAL POROUS PLUS 511” penetrating masonry sealer. The best way to do this is to roll it on with a paint roller, as this will make it easier to keep the sealer out of the grout lines, where the presence of the sealer will work against adhering the mortar in the joints. A brush can be useful to seal the bricks around the margins. Wait until the sealer is dry and then grout the installation. Most installations are grouted using MASON’S MORTAR which is sold either pre-mixed such as QUIKRETE® MORTAR Type N or S or you can make your own mortar by mixing one-part Portland cement with three parts sand. Sanded tile grout may also be used for grouting, these are similar products, the only difference is that sanded grout has a finer grind to the aggregate compared to a mortar, and colorant is added. Grouting can be done using either a grout bag, or by pointing the brick by using a London trowel to hold the mortar, and then pushing the mortar into the joints with a pointing trowel. Once the grout is in the joints, sponge the grout and the bricks to remove excess mortar and clean the bricks, changing the water frequently. Get the tile as clean as possible in the first go around, because once the tile is dry, if there is a grout haze, it can be difficult to remove. Some people will then “tool” the grout lines with either a dowel rod or a joint raker to make the joints a half round shape. Others prefer the flush joint, more of an antique tuckpointed look, achieved just by sponging it flush with the brick. Once the installation is dry, you can reapply the sealer over the entire install. For kitchen backsplashes, this is recommended. For a regular wall, this may not be necessary.